and raised in Dallas, Texas, Marka27’s foray into the art world began in the city’s streets mastering the art of graffiti. Advancing to earn his BFA from The Museum School of Fine Arts in Boston, Massachusetts, Marka27 became a household name for his “audio canvas” series and elaborately executed installation art and murals. Largely inspired by multi cultural influences, Marka27’s art has served as a reflection of his varying interests. 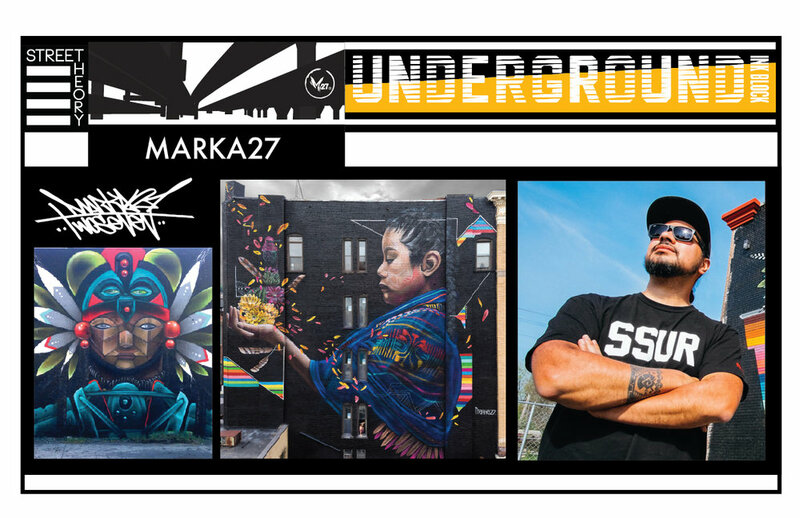 Beginning with iconic musical (and specifically hip-hop) figures, Marka27’s passion to infuse empathy into his art gave way to birthing magnificent and politically-charged masterpieces, some of which still grace both Boston, New York and Los Angeles’ city walls today, as well as San Francisco, Montreal, Canada, Mexico City and Monterrey, Mexico. His murals and artwork have been published in several books including Graffiti L.A, Burning New York, and Graffiti Planet.